The IOL Counselor™ is a patient education software program that has proven to enhance the communications skills of surgical counselors and doctors and dramatically increase the number of patients converting from standard monofocal IOLs to premium IOLs. It was originally introduced as a CD and can still be purchased in this format on this website. However, you can now purchase the NEW WEBSITE & TABLET VERSION to use on your website and tablet computers including iPads. Produced by Patient Education Concepts, Inc., (Houston) and Eyeland Design Network GmbH, (Germany), its initial distribution (March 2007, EyeWorld Magazine supplement) was directed to U.S. based practicing surgeons who are members of the American Society of Cataract and Refractive Surgery (ASCRS) through an unrestricted educational grant from Alcon Laboratories, Inc. and Advanced Medical Optics, Inc. with additional sponsorship from CareCredit®, Inc. Since its introduction PEC and Eyeland Design Network have launched a similar program, The LVC Counselor™ for laser vision correction counselors and currently offers the Sight Selector™ Family of patient education counseling programs that can be delivered on iPads™, Mac and PC computers and Online. 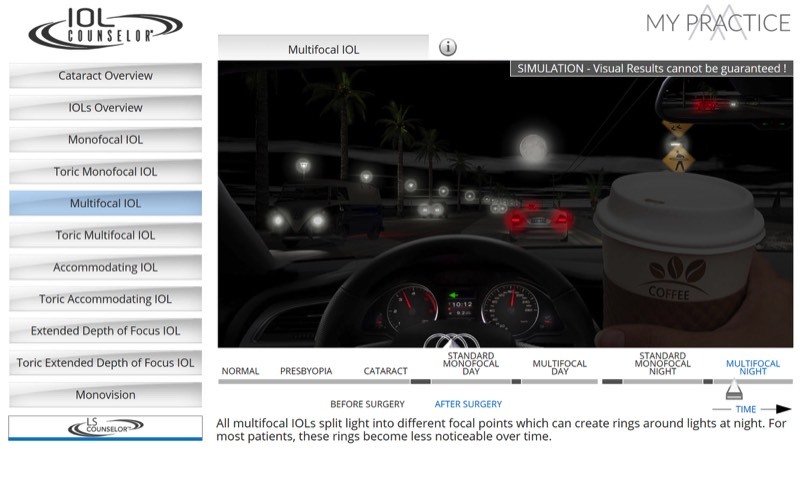 The IOL Counselor™ software uses dynamic, real-life scenarios that allow surgical counselors to vividly explain the visual effects of progressing from normal vision, to presbyopia, to cataracts and how a patient would see the world through standard monofocal IOLs versus presbyopia correcting IOLs. If you already have your IOL Counselor™ CD, you will need to Register and Activate your software using the CD’s serial number and a unique hardware number generated by your computer. Click on Registration/Activation to register or Training/FAQ to view a short registration and activation video tutorial. If you do not have the IOL Counselor™ CD, you can order one on the Products page. There are also add-ons and ancillary IOL Counselor™ products which you can purchase AFTER you own the IOL Counselor™ software. We trust that the IOL Counselor™ will be a dynamic practice building tool for you and a life-enhancing portal for your patients.